There are approximately 3.8 billion women on Earth. As roughly 50% of the world’s population, women are a powerful force across the globe – but what about in national-level leadership? As of January 2017, women accounted for only 23.3% of all national leaders globally. And these figures get even more disproportionate when we consider women of color in government leadership positions. This has been a hot topic of conversation as a major lack of representation was called out at the most recent G20 summit held in Hamburg, Germany. Of the 36 world leaders present at the conference, only three were women. This is a significant problem as a lack of diversity in leadership is correlated with a lack of attention to issues that affect underserved populations. In response to these glaring disparities, the United Nations’ United Women group launched a “Step Up for Gender Equality” initiative, asking governments around the world to make a commitment to increasing representation of women in leadership and closing the gender equality gap. The group keeps track of which countries have agreed to this effort, all while setting the goal towards “Planet 50-50 by 2030.” Ninety-three countries have taken the pledge so far, including the West African countries of Senegal, Benin, and Liberia. While not included on the official initiative list, Niger is focused on minimizing the gender equality gap over the next 12 years. According to Alex J. Kang, writer and professor of political science, the country’s adoption of women’s rights policies is due largely to the work of women activists in Niger and abroad. In her book, Kang details the pivotal moment in Niger’s history when the president of the country’s largest women’s organization pushed Nigerien leaders to give formal consent for the Convention on the Elimination of All Forms of Discrimination Against Women (a convention adopted by the UN in 1979) following a military coup in 1999. Any state that accepts this treaty commits itself to engaging in and documenting measures to end discrimination against women. By ratifying this convention, Niger legally bound itself to putting these measures into practice and submitting national reports on their progress. Eight years before the adoption of this treaty, women all over Niger banded together for the largest women’s demonstration post-independence. The women’s activist police commissioner at that time worked in connection with the protest leaders to organize a peaceful march through the capital city. 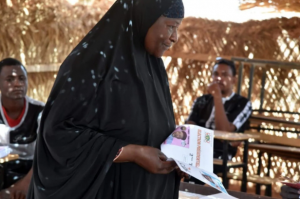 Women in Niger were tired of the near-exclusion of women from leadership positions as the country transitioned from a military regime to a democracy. The organizers called out the underrepresentation of women, blamed the prime minister and political parties, and presented a list of demands which included voting women into leadership positions. The timing of reform in Niger seems to be directly connected to the tireless work of women leaders of organizations dedicated to gender equality. Researchers have speculated that the gender quota laws that currently exist in Niger would not have come to be without the push from women leaders on the ground. The ripple effect of both the large and small protests of the lack of representation for women even trickles down to the well maintenance committees that Wells Bring Hope establishes in every village where a well is drilled. The law requires that at least 50% of the members of the committee be women. There is still a lot of work to be done to advance women’s rights around the world, but this moment in Nigerien history proves that every single voice counts.